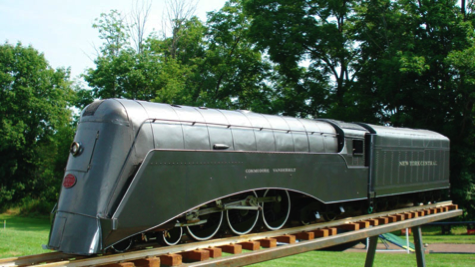 Steve Bratina shares how he built this beautiful live steam NYC Commodore Vanderbilt with us in this issue. In the 4th Quarter 2014 issue of the NYCentral Modeler you will find nine informative articles about modeling the NYCS. This is our largest issue to date with 108 colorful and interesting pages. David Howarth returns with the first of several articles on the NYC West Shore layout he is constructing in Australia. As you can see in the photo above Steve Bratina explains how he built the NYC Hudson, Commodore Vanderbilt in live steam. He will share some other live steam models with us in future editions. Bob Shaw adds the second of many articles about “Building an O-Scale Layout of the NYC Water Level Route”. In this part he explains how he wired the railroad and gives many good tips on layout wiring. Seth Larkin compliments his recent article in the NYCSHS Central Headlight on the NYC Lot 858-B boxcar with a detailed feature on modeling it in HO-scale. We are taken through the final steps of modeling a NYC DFA/B-1 set by Canadian, Rick DeCandido. This is his final of three parts on building this interesting loco. The NYC Niagara was the finest steam locomotive ever built and Rich Abbott shares his two 1/32-scale live steam Niagaras with us. Tom Bailey, NYCentral Modeler Assistant Editor, returns with an article on “Backdating a Proto 1000 NYC RDC”. And, of course, you will find all of the regular features about what is new for NYC modeling offerings, letters and emails, and many other interesting pages in this issue. If you are motivated while reading this issue, be sure to contact us about featuring your modeling, collecting or layout in a future issue. Just send us an email to: NYCSHS@verizon.net and we will help you “brag” about your model railroading. Go to the “Modeling Resources” dropdown and select the 4th Qtr 2014 edition or click here. This entry was posted in Members Information, NYCentral Modeler, NYCS News, NYCSHS Models. Bookmark the permalink.